William Morrow Paperbacks, 9780060934767, 368pp. 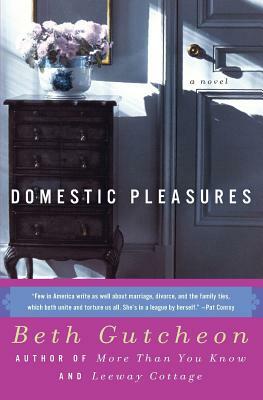 After her ex-husband dies in a plane crash, Martha Gaver is horrified to learn that the executor of Raymond's estate is Charlie, the conservative, insufferable lawyer who represented Raymond in their bitter divorce. Yet soon after they reenter each other's lives, Martha, Charlie, and their teenage children find they have more in common than they imagined as they struggle to rebuild their lives...and that opposites really do attract. Engaging,, witty, and entertaining, Domestic Pleasures is a touching, piercing tale of love lost, found, and embraced once again.